A historic Joplin home in danger of demolition. This last weekend, the Joplin Globe published a story on the two story house on Schifferdecker Ave. The handsome house with a stone facade belongs to the late J.T. Goodman and his wife, Yvonne. 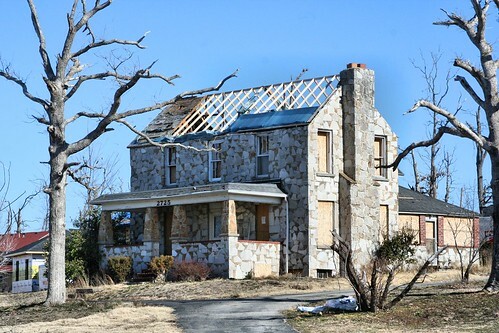 The historic home, which likely dates to the early years of Joplin, was damaged by the May 2011 tornado. As seen in the above photograph, the home presently has no roof which is accelerating its danger of being declared condemned by the city. Joplin history expert and director of the Post Memorial Art Reference Library, Leslie Simpson, is presently trying to research the history of the home in an effort to help its preservation. So far, Simpson has discovered that it was on the property of Thomas Cunningham, one of Joplin’s wealthiest citizens at the turn of the century. Likewise, a mortgage deed indicates it might have even been built in 1873. The historic home is currently before Joplin’s Building Board of Appeals. Unfortunately, due to the death of J.T. Goodman and a refusal by the Goodmans’ insurance company, the family has no funds to make the repairs needed to save the home. At the moment, Simpson is seeking to learn more of the home’s history which might translate to convincing the city Board of Appeals to spare the house more time to be repaired. If you know anything about the house pictured above, located at 2725 S. Schifferdecker Avenue, please contact Leslie Simpson at the Post Memorial Library: (417) 782-7678. This is a piece of Joplin’s history, it needs to be saved! This house should be saved. Joplin needs to save it’s history. Especially since so much of it was lost. This city is so quick to destroy our historical building instead of restoring them. Anything of historical value is disguarded.